Hi there! Today’s post is about another mani that I’m doing for the 31 Day Nail Art Challenge. This is challenge #6 VIOLET NAILS. For this mani I painted my nails with Miss Sporty Lasting Colour 500 (2 coats, middle and index fingers, thumbs). This is a gorgeous purple polish. I used MoYou London‘s Orchid Chic stamping polish and Pueen‘s 77 stamping plate (which is part of Pueen‘s Buffet Leisure collection). For the ring fingers and pinkies I used floral water decals and 2 coats of Jess Oxygen. Jess nail polishes used to be exclusive to Poundland, but the brand disappeared. I really liked this mani. 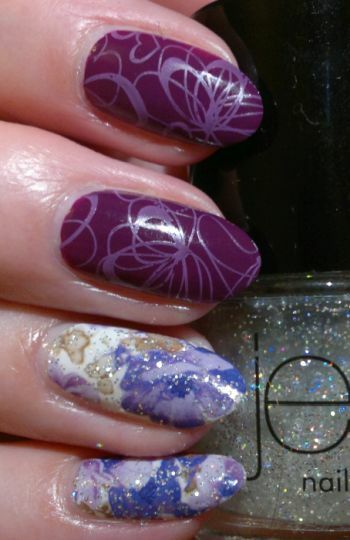 Purple is one of my favourite (nail) colours, and the decals looked very nice with the holo glitter top coat. 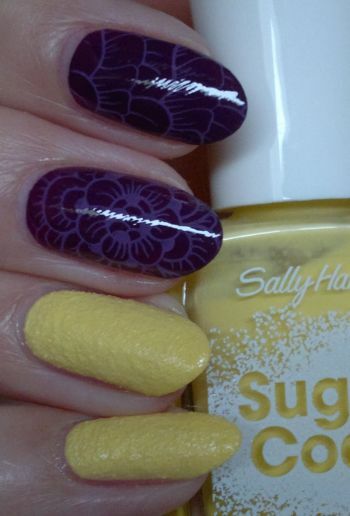 For this mani I painted my nails with Sally Hansen Sugar Coat 400 Sweetie (pinkies and ring fingers, 3 coats, but 2 coats would have been fine too) and Miss Sporty Lasting Colour 500 (middle and index fingers, thumbs, 2 coats). For the images I used Pueen‘s 109 plate (which is part of Pueen‘s Make Your Day stamping plate collection) and MoYou London‘s Orchid Chic stamping polish.